After nearly 24 years of life, I had never had “corned beef & cabbage”— for St. Patrick’s Day or any day for that matter. & I wasn’t sad about it. One-dish “pot roast” type dinners, where everything turned out looking & tasting the same with that soft mushy texture, simply did not call my name. 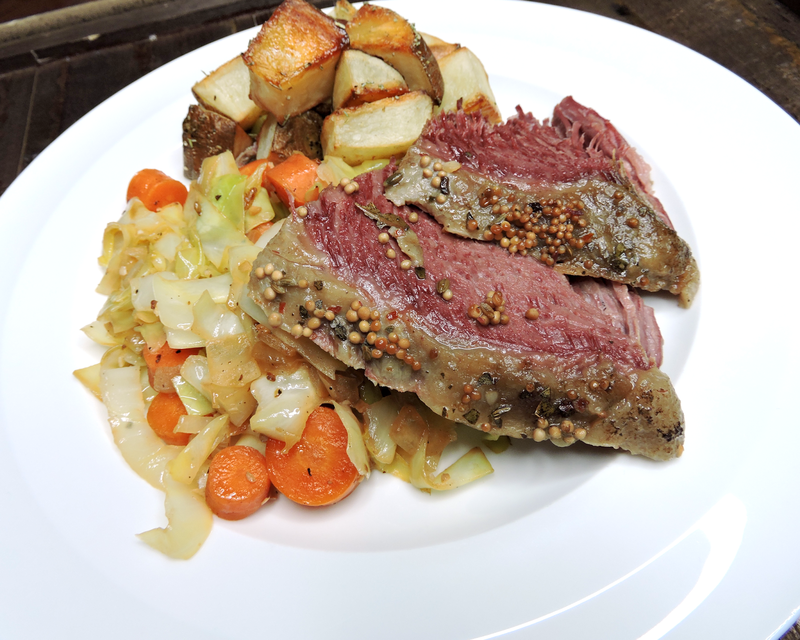 And the term "corned" beef just sounded plain weird. Once I moved in with Dathan, though, I was inspired to get a little more “festive” and adventurous with food. 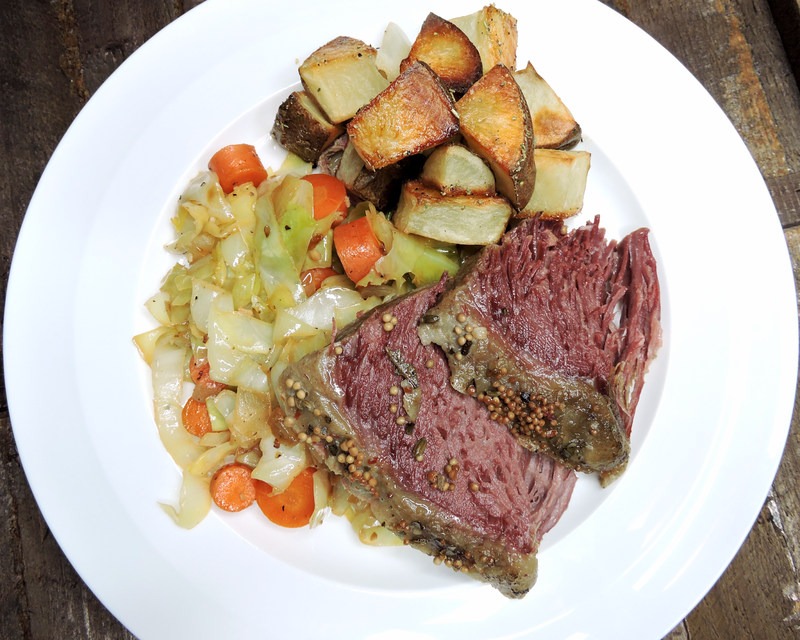 His mom always made a traditional “corned beef & cabbage” dinner for St. Patrick’s Day, and I wanted to keep up with that tradition to make him feel “at home” in our new apartment together. So, I did some research on what this whole Irish-inspired meal was all about, and gave it a shot. I actually loved it & couldn’t wait to make it again this year! But let's be clear: I loved it the way that *I* made it. So while it might not be the typical corned beef dinner, it still had all of the same components that everyone loves. I simply cooked each component in its own dish, to bring out the best texture & flavor. It's one or two steps more than simply throwing it all in the crock pot, but it's still so simple~ I promise! The meat slow cooks to perfection, while the veggies get their own sauté to keep all of their delicious flavor and texture. 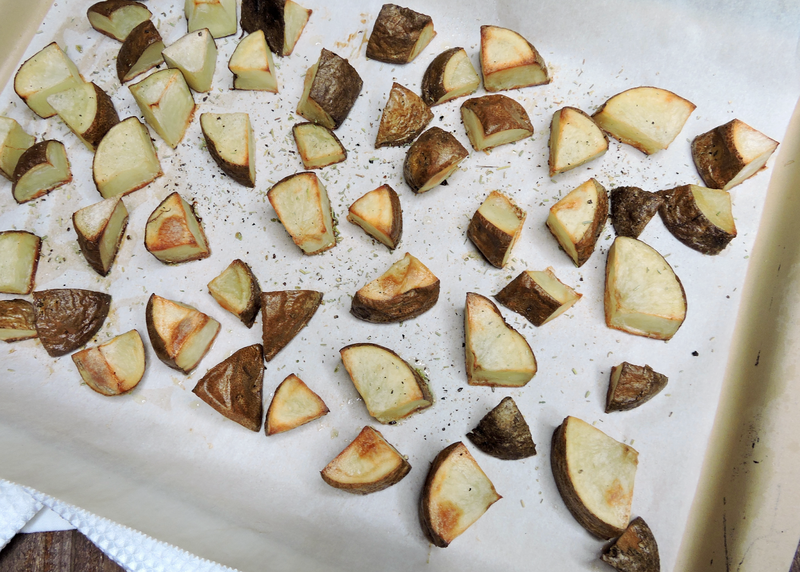 The potatoes roast in the oven to get perfectly crisp instead of soft & soggy. Of course, you could always throw it all in the slow cooker & still have a festive, healthy meal... But this one's for those of you who want to switch things up a little, like me! & If you haven't tried corned beef before, you absolutely must. Take it from a former non-believer. Enjoy! P.S. If you're on a Whole30 & worried about whether your corned beef is compliant, check out this Whole30 Common Additives Cheat Sheet from the Whole30 creators. I got our beef from Costco, & it was compliant! Place the beef in the slow cooker, and sprinkle the contents of the spice packet over top. Pour in enough water to cover the meat. Cook on "low" for 8 hours, then set to keep warm until you're ready to serve. About 1 hour before the meat is done, preheat the oven to 400ºF. Cut the potatoes into 1" cubes, and spread them out onto a parchment-lined baking sheet. Spray or drizzle with olive oil and sprinkle with the salt, pepper, garlic, and rosemary. Bake at 400ºF for 35-40 minutes, or until golden and cooked through. While the potatoes are cooking, prepare the vegetables. Cut the half of cabbage into quarters, then slice it into strips. Cut the carrots into bite-sized pieces. Chop the onion and mince the garlic. In a large sauté pan over medium to medium high heat, melt the butter. Sauté the carrots, garlic, and onion (stirring frequently) until they begin to soften (about 6-7 minutes). Scoot them to the edges of the pan & add the sliced cabbage in the center. Season with salt & pepper, then give it a good stir to combine all of the veggies. 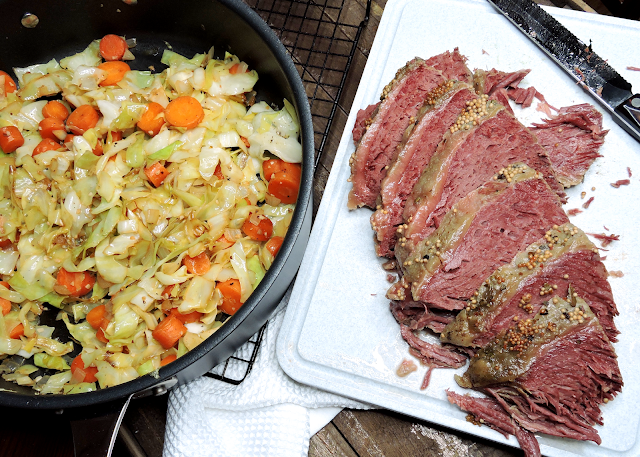 Continue to sauté until the cabbage cooks down and all of the vegetables are tender. Transfer the beef to a cutting board, and slice it. Serve over the sautéed vegetables with the crispy roasted potatoes on the side. Enjoy! I use a "Misto" that sprays my own extra virgin olive oil. You could also just drizzle the olive oil over top if you don't have a mister. Hello! Thank you for the recipe and post! 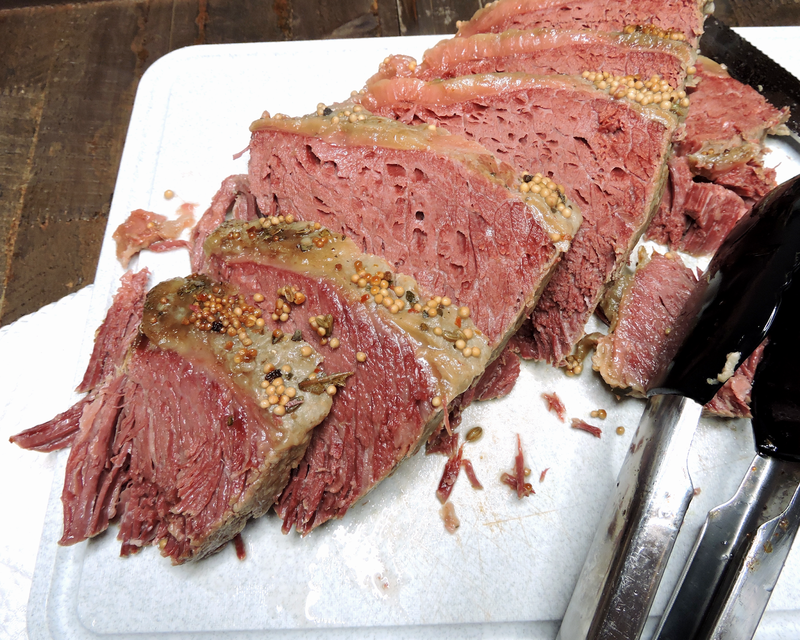 Do you happen to know what brand of corned beef from Costco that you used? I just checked costco today and the two brands that they had were not Whole30 compliant and I was so sad! Thanks in advance for any info you might have! I am still looking for a compliant one as well! I have looked at Costco and Wegmans. I found a recipe to brine one yourself, but I would LOVE to find one already prepared! I'll be surprised to know if someone doesn't salivate profusely upon reading this. An idea for an very elegant dish and nicely presented in the form of both text and pictures. Must read.